Many new backyard astronomers have trouble understanding the often heard references to “degrees”, “arc minutes”, and “arc seconds” when talking about the separation of celestial objects. So here’s a primer on measuring angular distances. This article will give you basic essential skills to finding your way around the sky. Astronomers measure angular separation of objects in degrees. There are 360 degrees in a circle. And the angular separation of any point on the horizon and the point directly overhead (the zenith) is 90 degrees. Halfway from the zenith to the horizon is 45 degrees. So far, so good? The width of your little finger at arms length is 1 to 1.5 degree(s). Not everybody's hands are the same size and thus there would be inaccuracies in using this method for anything other than quickly finding obejects. There is a way to minimize the errors but "calibrating" your hands. Using this picture, you can gauge where to hold your hand in front of you to get the same results. Now let’s go smaller. 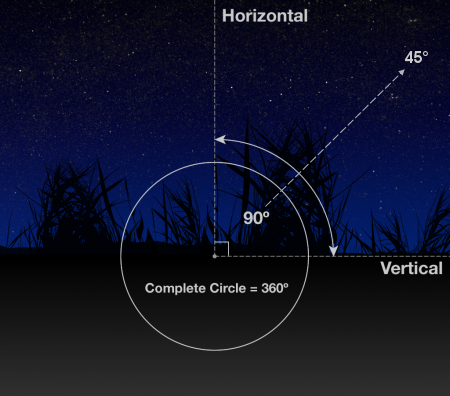 When you look through a telescope, you see a field of view of 1 degree or less… a very small slice of sky. Astronomers measure angles smaller than 1° (degree) in arcminutes, or “minutes of arc”. There are 60 arcminutes in one degree, so 1 arcminute is 1/60 degree. The symbol for arcminutes is a single apostrophe ( ' ). So the full Moon, for example, is about 31' (thirty one arcminutes) across. Coincidentally, so is the Sun. This is why the moon covers the sun almost perfectly during a solar eclipse. 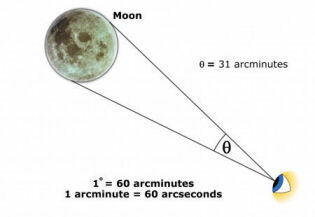 Each arcminute is divided into 60 arcseconds, or “seconds of arc”. So 1 arcsecond is 1/60 arcminute and 1/3600 degree. An arcsecond has the symbol of an open quote ( " ). The face of Jupiter is about 50" across in apparent diameter. The two larger components of the multiple star system, α Herculi, are 4.6" apart. A good optical telescope in steady skies can resolve down to about 1" (one arcsecond). The angle between the visible horizon and the the north celestial pole, marked almost exactly by the North Star (Polaris), is your latitude. Same for southerners, relative to the south celestial pole (although there is no equivalent bright star at the south celestial pole). How does one find the north star, Polaris? Click on the link to the next page below to find out. Send emails to: webmaster@fortworthastro.com FWAS is a member of the Astronomical League.